Rumors of iOS 5.1 including native Facebook integration first surfaced in January when iMore found a contact field for your Facebook ID within the contacts app in iOS 5.1 beta 3. Now, we have come across some more evidence that should confirm this rumor. Thanks to some super sleuthing by the guys at Techie Buzz, they have noticed that updates being sent from the native iOS Facebook app once again show up as sent via 'Facebook for iPhone' or ''Facebook for iPad', depending upon your device. If you remember, Facebook stopped showing this message a while back and would only show sent via 'Mobile', which is also what you see when you post an update through the Android app. This happened around the same time when Apple dropped Facebook sharing option from Ping. But now it seems in preparation for the Facebook integration within iOS, Facebook has changed the way updates sent from the iOS app are being reported. And this is happening just a few hours before the iPad 3 event, where Apple is likely to also announce iOS 5.1. Meanwhile, updates sent from the Android app continue to be shown as sent via 'Mobile'. So it seems Apple and Facebook have finally put aside their differences and decided to work together. The Facebook integration should come as a welcome addition and will benefit everyone involved, the user, Apple as well as Facebook. Yeah now I like the team spirit!! 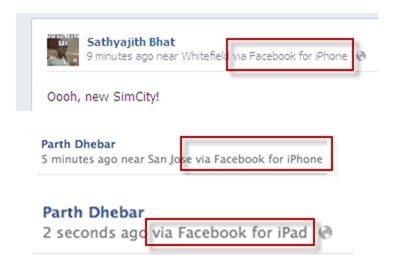 Facebook isn't integrated into iOS. What we do have - and I don't think this is new - is the ability to store Facebook usernames in contact entries. Tapping the username loads Safari to take you to that person's profile page.